WELCOME! THIS SITE HAS INFORMATION ABOUT A LARGE GROUP OF POLLUTANTS KNOWN AS "AIR TOXICS" OR "HAZARDOUS AIR POLLUTANTS"
The New Jersey Department of Environmental Protection (NJDEP) has been working to reduce outdoor exposure to air toxics in our state since 1979. 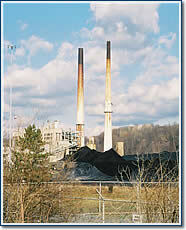 At this web site you can learn about air toxics and what we've been doing about them. In 2018, the U.S. Environmental Protection Agency (USEPA) released its latest version of the National-Scale Air Toxics Assessment (NATA), for 2014. NATA is an ongoing comprehensive evaluation of air toxics in the U.S. NATA uses a nationwide inventory of emissions of air toxics from point, area, and mobile sources to estimate outdoor air concentrations, and the resulting potential exposure and health risks across the country. NJDEP has analyzed USEPA’s 2014 NATA data for New Jersey, and has updated this air toxics web site with the 2014 information. To view NJDEP’s analysis, use the buttons on the left of the screen to navigate through this web site. For USEPA’s webpage on the 2014 National-Scale Air Toxics Assessment, click here.